On Monday, September 26, 2005 a decision was made by the Film Federation of India jury that causes a controversy . . . what’s all the fuss about? Yes, it is official that India’s entry for consideration for an OSCAR will be Amol Palekar's Paheli (released in June 2005). In India’s history, there have been 3 films that have had the privilege of going to the Oscars: Mehmood Khan’s Mother India, Mira Nair’s Salaam Bombay, and Ashutosh Gowarikar’s Lagaan. Unfortunately, India hasn’t won in the Foreign film category, the biggest acclaim probably came in 1982 when Richard Attenborough’s Gandhi won in some of the popular categories. I know that one day, India will win the Oscar in this category, but it won’t be for Paheli. Aren’t all awards the same? Does it really matter? Nobody is ever happy with any selection ever made for any awards show. Whether it is FILMFARE, SCREEN, ZEE CINE, STARDUST, etc. there is always somebody who will not be content. What’s the big deal about the Oscars? Its really an awards show to recognize excellence in filmmaking in the United States aka Hollywood. The FOREIGN FILM category gets about 60 seconds of exposure and then they move on to the rest of the evening. Mind you, how many people even watch the Oscars in India? Perhaps the last time, 2001, when Lagaan was part of the category, millions and millions of people were excited, but yet again, we lost. Let’s look at some past controversies. For instance in 2004, so many categories and ridiculous winners and more controversies and rumours like: “The Chopras bought the awards” or “Shah Rukh Khan always wins”. Well, are these statements true? In my opinion, NO, because sometimes even the best of them don’t win. Yash Chopra made a fine Veer Zaaraonly to have Kunal Kohli win BEST DIRECTOR at the Filmfare Awards. AR Rahman produced the best soundtrack with Swades and Meenaxi (not even nominated), but Anu Malik walked away with the trophy for Main Hoon Na. Not only that, more recently we had the most preposterous announcement that Saif Ali Khan won a NATIONAL AWARD for Hum Tum. So let me ask this . . .doesn’t every award have its share of winners and nominees that don’t deserve the limelight? What about 2003? As much as Hritik Roshan was good in Koi Mil Gaya, both actor and film swept most of the awards leaving Kal Ho Na Ho and Shah Rukh Khan biting the dust. There was a big deal made then as well. Even in 2002, when Devdas was selected as India’s entry for the Oscars, there were people who wanted RGV’s Company to be chosen. Whether you love him or hate him, Shah Rukh Khan is sellable as an actor and he is recognized in North America more and more. Not only that, even though Paheli opened to mixed reviews, it was a success in the overseas market playing for weeks. This could possibly be one of the reasons it was selected. This Khan is always part of media stories, so this controversy is only the beginning. Don’t get me wrong readers, I am not defending Paheli as the perfect choice or supporting it, but what’s done is done. Hmm . . . the issue is deep. So many people have claimed that Black should’ve been selected. I believe that there were other selections that would’ve made fine representations for India. Yes, despite the fact Black was mostly in english, it was an Indian film. I believe it deserved recognition at the international level. However, I also find that Veer Zaara would’ve made a fine contender because with relations being better between Pakistan and India, the film showed a great love story. 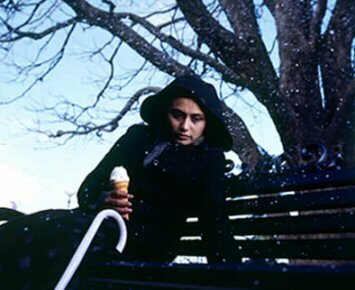 Parineeta would’ve been a good selection as it showed human relationships, secret relationships, and open relationships in a new light. Even Swades would’ve been a decent selection as it shows one man’s journey to return to his roots. The list can go on . . . everybody has their favourites. Veer Zaara, Swades, Page 3, Black, Hazaaron Khwaishein Aisi, Iqbal, Sachein (Tamil), Anniyan (Telugu), Mangal Pandey, Achuvante Anna (Malayalam), Graham (Telugu), Uttarayan (Marathi), and Kadal (Tamil). Paheli being chosen has made some people happy, and others shocked. So what’s the big deal now? Whether the film was selected by lobbying by the Rajasthan Tourism, or Palekar and Khan’s influence, what’s done is done! This story will stay in the news for a few weeks, die down, then when nominations are made, it’ll be in the limelight again. Does Paheli have a chance of getting nominated? No. Why? Because it is a fantasy film made to enjoy like you are in a slow dream and just enjoying the cinematography, the costumes, the music, the performances . . . it doesn’t reflect Indian culture, it just shows the plight that a human being can go through, whether its natural or supernatural. I personally liked Paheli, however, I would not select this film to represent India at the Oscars. Amol Palekar is a fine actor and proved to be a good director, but his film will unfortunately be mocked for months to come. The real test has begun for them now. . . yet they don’t care because they’ve won round 1. We’ll have to wait for the official Oscar nominations in 2006. Miracle worker . . . Duvidha . . . you get the picture? The main news item is Black was robbed and Paheli has won. Everyone talks about how Black is a remake . . . well . . . even Sanjay Leela Bhansali has claimed that Black has shades of Helen Keller’s story. But have people forgotten that Paheli is also a remake of a 70s film called Duvidha? This controversy has put everyone in a dilemma! I don’t want people to begin hating Black because its now getting the recognition it deserved. Dropping the issue is probably best. I would rather Black gets INDIAN recognition at the regular awards than at the Oscars. Yes, because the Oscars are overrated! The riddle is this: How can one movie cause so much controversy? Well, the answer is simple . . . Bollywood has actually gotten bad recognition throughout the years for churning out hundreds of films with over 90% having no substance. However, since Diwali 2004, I can honestly say, that filmmakers have began working on making some quality products, entertaining and wholesome films. There were MUCH better films than Paheli that had the aesthetics that would’ve made India proud at the Oscars. 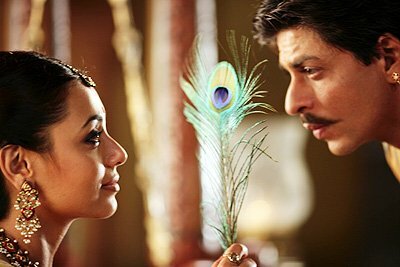 The Hollywood Foreign Press, who ultimately has the final decision to nominate, will not like the frills and colours of Paheli because in the end, it’s a fairytale, a fantasy film. Hollywood wants films that show humans fighting or overcoming all odds (like Lagaan did). Unfortunately, it is clear that Paheli will not get us an Oscar nomination, but the final decision is done. We hold no power to appeal this ruling. So the final question is: what’s the big deal?